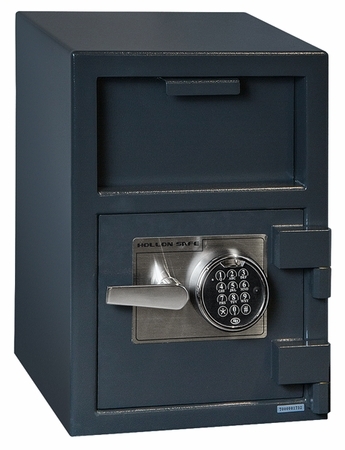 Hollon Depository Safes are now available on our site.Â Models HDS-01K, HDS-2014K, HDS-2014E, FD-3020E, and FD-3020ck.Â The folks at Hollon Safe have done a great job on these models.Â Very solid structural integrity and reading to take a beating from any would be thief!Â All models are designed to be bolted to the ground or any available surface.Â The HDS-01K can also be wall mounted. (Just make sure you have some substance to screw into besides sheet rock…at over 40 lbs is will pull itself out of the sheet rock).Â We have also decided to make these our featured drop safes on our site this month and you will find some very affordable prices going on now. Mutual makes a reasonably priced line of burglary resistant, fireproof, stand-up gun safes. All models feature a UL approved heat-activated door seal and two layers of sheetrock like insulating material. They are fireproof rated at 1760° F for a period of 60 minutes. Burglary resistance features include at least 4 dead bolts facing the hinge side, 1 active bolt at the top and at least 4 active bolts facing the opening side. In addition, they utilize massive 1-inch steel locking bolts. The lock is protected from drill-out attempts by a spring-loaded relocker and a Manganese hardened drill resistant steel plate. These gun safes also feature two bolt-down holes at the bottom of the safe which accomodate 1/2″ bolts. They also feature a 10 gauge steel body and door, semi-gloss black exterior with tan interior and a 5-inch thick door. The interior features universal adjustable gun racks and shelving that can be arrange as gun racks and shelving or all shelving. The dial locks are UL listed and the handles and locks are brass-plated. The main difference between models is their size, and their are three models available. The Model MS-5922 weighs 350 pounds and measures 59″ x 22″ x 16″. It can be ordered with an optional electronic keypad locking mechanism and can hold up to 16 long guns. Measuring 60″ x 30″ x 24″ and weighing 600 pounds, the Model MS-6030 is also available with an optional electronic keypad locking mechanism and can hold up to 22 long guns. The Model MS-6040 measures 60″ x 40″ x 24″, weighs 800 pounds and can hold up to 40 rifles or shotguns. It is also available with an optional electronic keypad locking mechanism. For more information on Mutual gun safes, and details about where to buy, visit the Value Safes website.